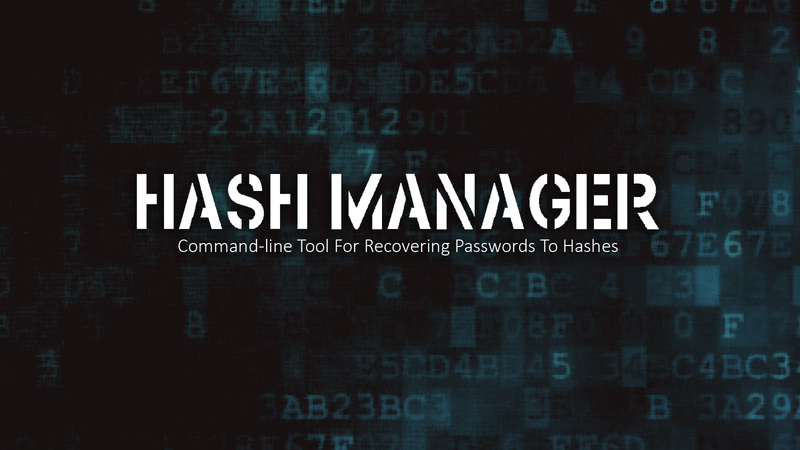 Hash Manager is a free command-line tool designed for recovering passwords to hashes. Supports over 470 hashing algorithms. Contains over 70 additional utilities for handling hashes, passwords, and dictionaries. Unlimited loadable hashes, dictionaries, rules, and masks. Maximum optimization for working with large hash lists. Maximum optimization for working with dictionaries. Hashing modules as stand-alone DLL files. Convenient control over operation using command files. How to interrupt the program? Press the keyboard shortcut Ctrl+C or Ctrl+Break. The program will save its current state and resume the attack when it is launched again. How to run an attack all over? Clear the "LastPosition" parameter in the respective section of the INI file. To start an attack all over every time, set the "Read-only" attribute on the INI file. How to remove the restriction on the number of dictionaries (or masks)? Set the "MaxLines" parameter to the required value in the respective section of the INI file. How to ease up the entry of long algorithms on program start? How to redefine the file for saving found passwords?